Depending on the needs of your workplace, sometimes it's best to hang up your health and safety kits on the wall where you can easily see and access them. The Wall Mounting Bracket for First Aid Containers provides the support you need to secure your containers in the designated health and safety areas. Why Use a Wall Mounting Bracket? Brackets can be used to hang kits and containers up on the wall, rather than having to find space to store them, which can economise on a lot of space. Some first aid or culinary kits come ready fitted with a hanging bracket, but for those that don't, use one of these individual brackets to install your case where you see fit. This simple to fix wall bracket is made to withstand the size and weight of small to medium kits that you wish to be mounted to a wall. 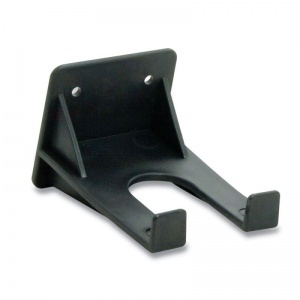 It securely hooks under kit handles to ensure that they stay firmly in place, but can be easily removed when needed. The Wall Mounting Bracket for First Aid Containers is usually dispatched via First Class Royal Mail and delivery should be within 1 to 3 working days.